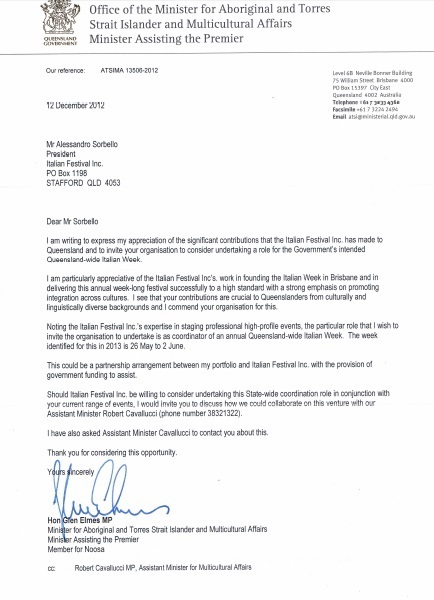 I'm writing to express my appreciation of the significant contributions that the Italian Festival Inc. has made to Queensland and to invite your organisation to consider undertaking a role for the Government's intended Queensland-wide Italian Week. I am particularly appreciative of the Italian Festival Inc's. work in founding the Italian Week in Brisbane and delivering this annual week-long festival successfully to a high standard with a strong emphasis on promoting integration across cultures. I see that your contributions are crucial to Queenslanders from culturally and linguistically diverse backgrounds and I commend your organisation for this. Noting the Italian festival Inc's expertise in staging professional high-profile events, the particular role that I wish to invite your organisation to undertake is as coordinator of an annual Queensland-wide Italian Week. The week identified for this in 2013 is 26 May to 2nd June. Should Italian festival Inc you willing to consider undertaking this State-wide coordination role in conjunction with your current range of events, I would invite you to discuss how we could collaborate on this venture with our Assistant Minister Robert Cavallucci (phone number 3832 1322). I have asked Assistant Minister Cavallucci to contact you about this.